The Philippines and Taiwan have begun parallel investigations into the shooting of a Taiwanese fisherman amid a diplomatic row. A team of eight from Manila arrived in Taiwan on Monday, while a team from Taipei also arrived in the Philippines, officials from both sides confirmed. The Philippine coast guard shot dead fisherman Hung Shih-cheng, 65, on 9 May in disputed waters. Taiwan has dismissed Manila's apologies and has imposed economic measures. "The [Philippine] visitors will have a look at the autopsy report on Hung Shih-cheng this afternoon," a spokesman for Taiwan's Justice Ministry was quoted by Agence-France Presse news agency as saying. The team, which will stay until Friday, will be inspecting evidence, reviewing data and taking a look at the Taiwanese fishing vessel, the spokesman added. Meanwhile, a spokesman from the Philippine National Bureau of Investigation also confirmed the arrival of the team from Taiwan, but gave no further details. The fisherman was shot in waters which both sides say lie within their 200-nautical-mile from shore exclusive economic zone. The Philippine coastguard said its crew acted in self-defence, believing Mr Hung's boat was trying to ram their vessel. 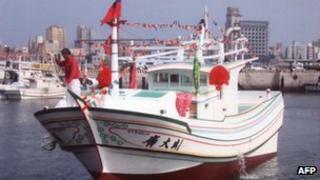 However, the other Taiwanese fishermen on board denied this and gave a different version of events. The Philippines apologised for the incident, but Taiwan rejected the apology, saying it lacked sincerity. Taiwan has imposed a host of economic measures against the Philippines, including suspending visa processing for Filipino workers and cutting trade exchanges. It has also conducted military drills in the disputed waters.